2,000 Exxon credit cards. That should do it. He wanted a couple of credit cards. He got a couple of thousand. Manhattan accountant Frank Van Buren found himself flooded with plastic in recent weeks, as the ExxonMobil cards kept on coming. Van Buren, who said he has had an ExxonMobil account for his business for 17 years, had ordered two copies of his card because it was expiring. He got the cards he requested — and then got two boxes with 1,000 cards each. Van Buren said it took hours to shred the cards, which all had his name and account number. An ExxonMobil Corp. spokeswoman said they are “looking into the mix-up”. Good idea. July 26, 2007 Posted by oldstersview | Dumb Stuff	| Comments Off on 2,000 Exxon credit cards. That should do it. You’ll never catch me , copper! 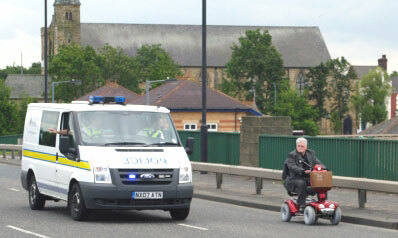 This plucky pensioner led police on a low-speed chase around Middlesbrough – and then gave officers the slip. The lukewarm pursuit started after he caused traffic chaos by crawling down the fast lane of a busy dual carriageway. Police asked the stubborn senior citizen to pull over. But he defiantly cranked his battery-powered mobility scooter up to its top speed – 8mph – and somehow managed to escape their attention. Then the determined OAP veered onto the Cannon Park roundabout where he gave red-faced officers the slip. Another police vehicle joined the “chase” and they eventually found him and “escorted him to safety”. July 26, 2007 Posted by oldstersview | Dumb drivers	| Comments Off on You’ll never catch me , copper! New Jersey — where else? Someone stole 1,000 gallons of water from Daisy Valdivia’s backyard [in Paterson, New Jersey]. And they didn’t spill a drop. Valdivia woke Wednesday morning to find that her family’s inflatable pool, hip high and 10 feet in diameter and filled with water, was stolen from her backyard in the middle of the night. There is no evidence that the water was poured out, pumped out, evaporated or drunk. July 26, 2007 Posted by oldstersview | Crime	| Comments Off on New Jersey — where else? In a turn of events that sounds like it was the product of a comedy animator’s imagination, a crow managed to set fire to a field outside Enköping [Sweden]. First, the crow flew into an electricity cable. Then, after a nasty electric shock the bird burst into flames, burning to death. Still ablaze, the dead crow dropped to earth, landing in a pile of hay in the field in Österunda, outside Enköping , 80km west of Stockholm. The hay quickly caught fire and the blaze spread to the whole field before four fire engines arrived to put a stop to the infernal farce.